Both of these teams may consider themselves unfortunate to be playing each other in the Top 16 of the EuroCup. The Zagreb side picked up a 6-2 record in the regular season while the Spaniards progressed with a 7-1 record. This means both of these teams played very well and would have preferred for their dominance to be better reflected in their choice of opponents at this stage of the tournament. It should make for a fantastic match on Wednesday night. Cedevita managed to lose their opening two fixtures of the regular season but a 6 game winning streak turned their season around, allowing them to finish in a strong position. They’ll come into this game with confidence and they’ll look towards Miro Bilan to make a difference. Bilan has offered an average of 14.5 points per game, with an average of 6.6 rebounds per game as well, and he has been hugely influential for Cedevita this campaign. There has also been support from Rashad James who has chipped in with an average of 10.3 points per game so far this season. There are plenty of players that can make a difference for the Zagreb side on Wednesday night. One thing that is notable from the Valencia side is that they get points from a wide range of players. This means that there is no one in the Valencia squad in double-digits for the season but there are still plenty of players that can make a difference. Fernando San Emeterio has grabbed an average of 9.8 points per game, Antoine Diot has offered an average of 9.6 points per game and Viacheslav Kravtsov has chipped in with an average of 9.3 points per game. Valencia have also managed to win 6 games in a row, so this is going to be a clash between two sides who are flying high in European duty this season. 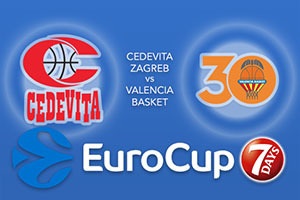 Both teams will fancy their chances of a result so take Cedevita Zagreb at +4, at odds of 1.90. Anyone looking at the Over/Under market should go OVER 164.0 at odds of 1.90. Bet Now!